I always thought food tasted better from real utensils than the disposable take-out variety (I hope that doesn’t make me a food snob). For a while now, we bring our own non-disposable chopsticks and forks to restaurants that we know use disposable utensils. As rule, I carry a spork in my backpack, just in case. I didn’t want have to carry a set of utensils (fork knife, and spoon). 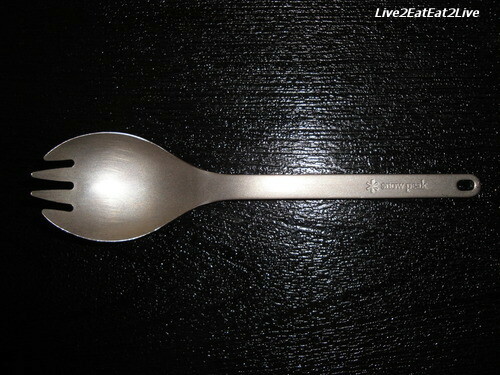 The spork is a good compromise. We’ve even brought our own Pyrex containers to carry home our take-out orders from some restaurants. I recently learned about the “my hashi” movement where people are encouraged to use their own non-disposable chopsticks. Hashi is Japanese for chopsticks. 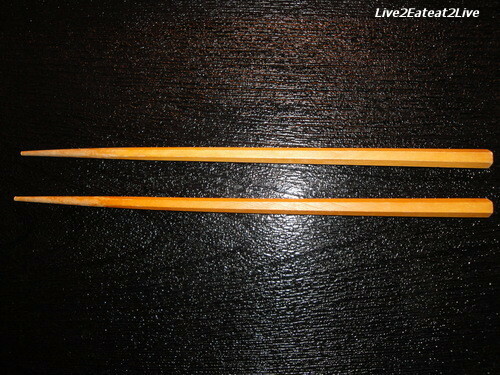 The goal is to help the environment by reducing the use of disposable chopsticks. Now we have a reason to bring our own utensils without people looking at us strangely. The statistic about unhygienic conditions is scary. Where else is this a problem? I’m sure the problem is not only in China but other places as well. We found these chopsticks at our Japanese warehouse membership store they were under two dollars each. We don’t really have to worry too much about them if they get lost. 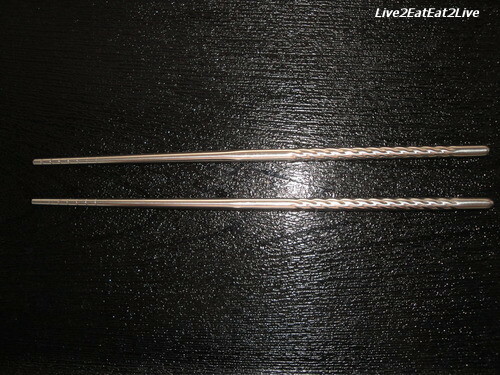 My chopsticks are stainless steel. The Cat’s chopsticks are six-sided to prevent them from rolling. Who knows, maybe the “butterfly effect” really can work. Getting off of the soap box now. By the way, Have a happy and safe Halloween. A while back, I posted about lemons preserved in salt. 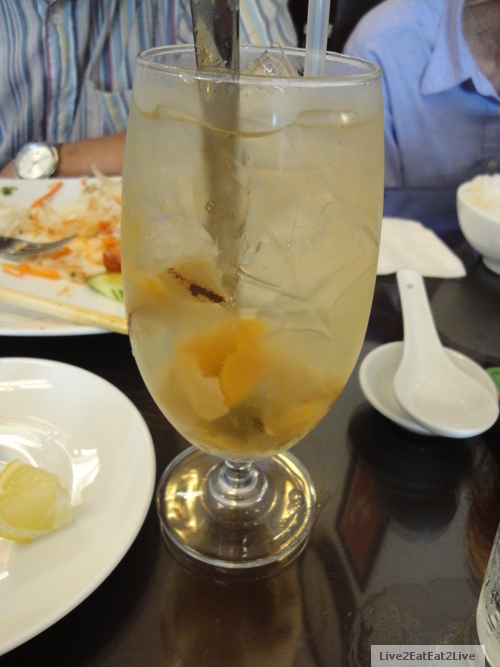 On the menu at a Vietnamese restaurant we ate at recently, one of the drinks was salted lemonade. I didn’t make the connection immediately that the drink would be made with preserved lemons. I wasn’t in the mood for the sweetened lemonade so I gave the salted lemonade a try. Right now, I think I like the salted lemonade more than the traditional sweetened lemonade. I may try this at home. 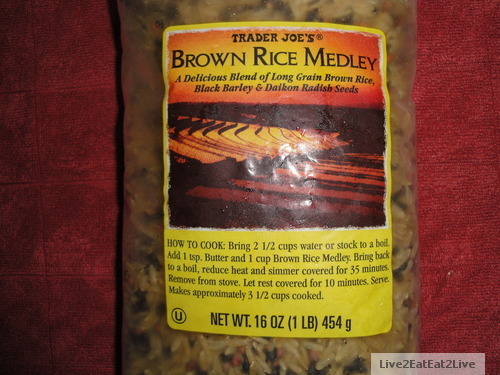 Our cousins P & B gave us a package of Trader Joe’s brown rice medley. They said they liked this blend. I tried some for lunch the other day. 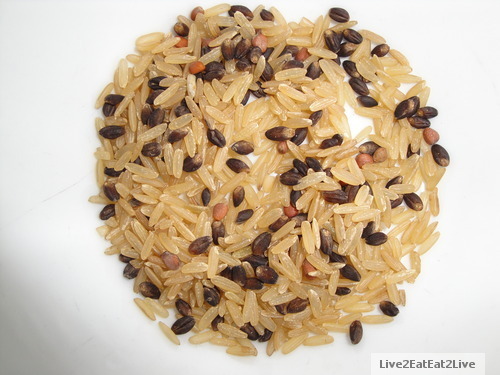 The medley consists of parboiled long grain brown rice, black barley, and daikon radish seeds. Most, if not all, of our stir-frys have no recipes. I think it’s the influence of Aunty P. She taught me the process of cooking, not the recipes. It’s hard to buy the exact amount needed to use all of one vegetable in one dish. As a result, our refrigerator (and freezer) sometimes has a little bit of this vegetable and a little bit of that vegetable. When there are a couple of orphan vegetables in the refrigerator, I will throw them in a stir-fry (aka chop suey). I was cleaning out the camera of orphan pictures and came across these stir-frys that I’ve done. 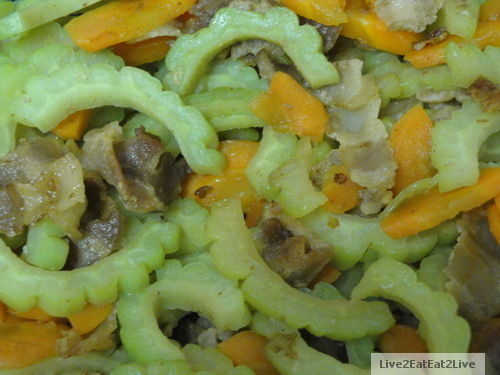 Ku gua (bitter melon), carrots, and pork. 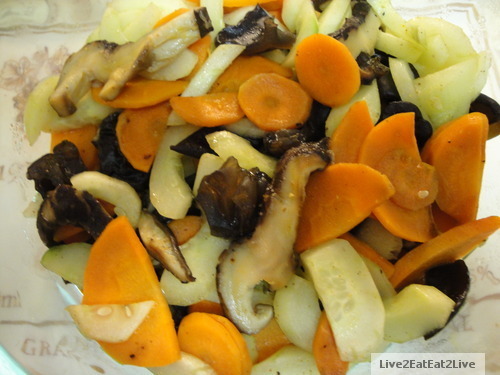 Cucumber, carrots, dried mushrooms, and black fungus. 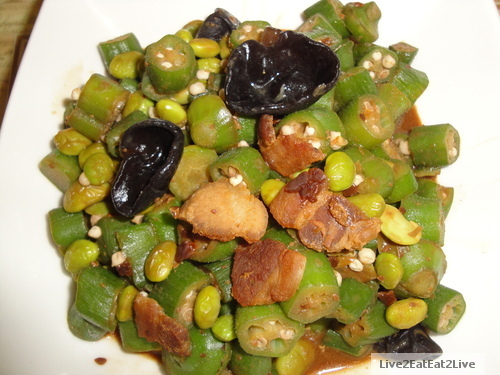 Frozen okra, frozen soybeans, pork, and black fungus with doenjang (Korean fermented soybean paste). 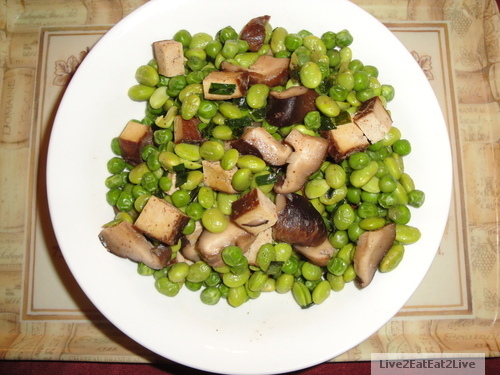 Frozen soybeans, frozen peas, dried mushrooms, and doufu gan with Chinese five spice. This a good way to clean out our refrigerator. The combinations are endless. I briefly posted about eating at Side Street Inn previously when our cousin B had a close encounter with wine of the Flock kind (don’t worry if you don’t get it, it’s an inside joke). Anyway, the original Side Street Inn is affectionately known as a dive. The owners recently opened another location which is supposed to be “with a touch of fine dining” (in the restaurant’s own words). Our cousins P & B (I should just start referring to them as peanut butter, sorry), invited us to dinner at the new location on Saturday. Here’s the restaurant’s map and website: Side Street Inn On Da Strip. 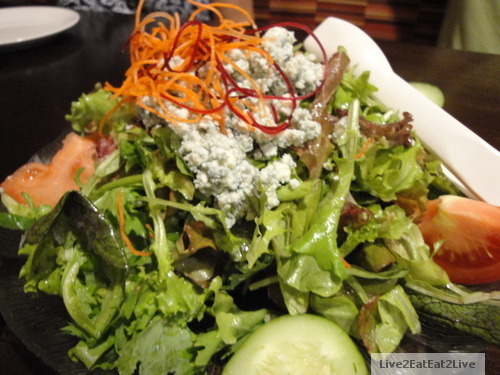 We started with B’s favorite salad, the Nalo Green Salad. Nalo greens come from Nalo Farms, a local farm famous for their baby greens. Here’s their website: Nalo Farms. On a side note, I didn’t take pictures the last time because I was worried P & B might think I was crazy (obsessed, weird, add you own description). Since then, they know I’m nuts and tolerate me anyway (they indulge my picture taking). OK, back to the food. As it turned out, each of us order something and we ate family style. P ordered Da’ Spicy Chicken. Boneless pieces of chicken, deep fried, and dipped in a spicy sauce. 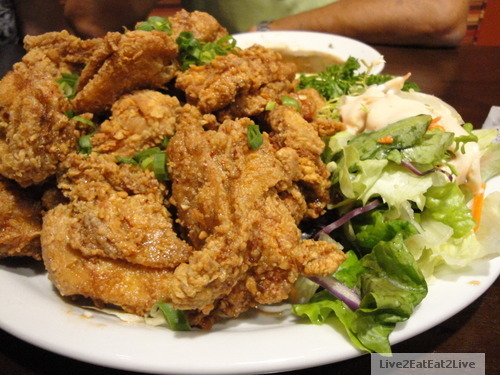 I seem to be eating a lot of fried chicken lately, not planned (at least not consciously). Need to set up an appointment with the shrink (just kidding). The Cat ordered Da’ Works, fried rice with everything thrown in except the kitchen sink. 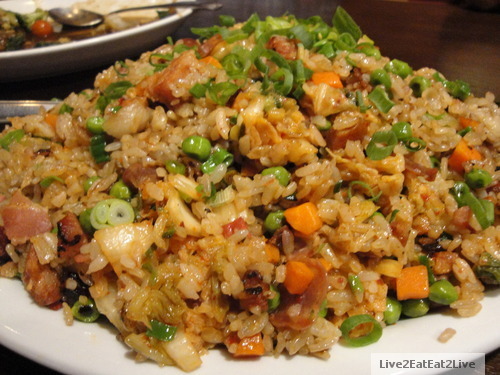 Besides Da’ Works, the restaurant has several fried rice options including kim chee. You would think I would be the one ordering fried rice but The Cat beat me to it. In addition, another item caught my eye, Da’ Kapahulu “KAU-KAU” Side Sliders. I posted about this item previously. 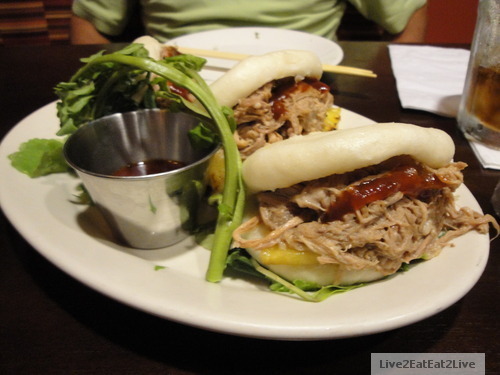 Kalua pork, pineapple, Chinese style buns, enough said. This is another dish accompanied by angels singing. The sliced pineapple adds just a bit of texture and taste contrast, perfect. 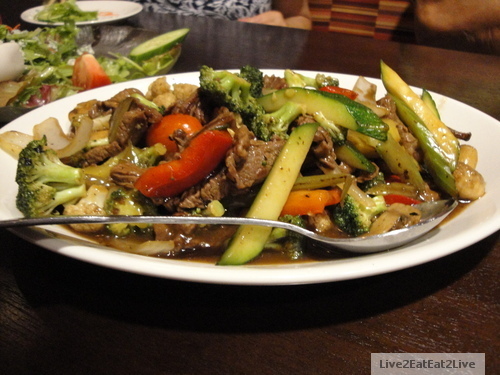 We added chop steak to the order to get a bit of vegetable balance to the meal. I think chop steak is a local adaptation of chop suey. It’s usually with sliced beef and a brown gravy. This was good. Another eating event of good food, good company, good eating, and lots of laughs.